Motion ride with ultimate feeling of immersion. Turbo Ride™ is a virtual reality (VR) ride that combines precise motion with high quality 3D image, clear sound and great choice of special effects. Our main goal was to achieve feeling of complete immersion. We focused at creating WOW and delight to customers. They will be able not only to watch and listen, but also to feel everything that is happening on the screen. Turbo Ride™ is an innovative amusement ride that offers unique combination of technologies to create ultimate experience, where you would dip into the water, fly in the sky, feel the wind, rain and fog. Along with these breathtaking effects 3D image helps create real-life experience, high quality sound enhances virtual environment and motion platform fortifies your experience by smoothly riding you. 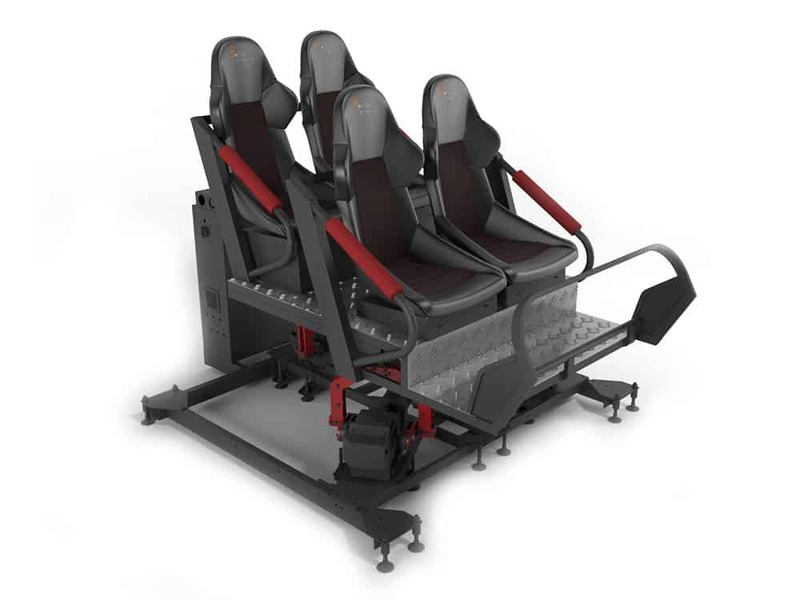 We built Turbo Ride™ based on our vast experience of operating different motion simulators. This helped us take into account many factors related to installation process, operation and maintenance. It is built for convenient use and great experience for customers. Let’s ride! Precise synchronisation of video sequence and 3 DOF motion platform movements. 5.1 surround sound. We have sound professionals in our team so we do care about sound. You will be able to watch high definition video and enjoy powerful and clear surround sound. A set of built-in and optional special effects that include wind, water mist, strobe and bubbles amongst others. High-quality exclusive content. In our attractions we offer large diversity of content that would be regularly updated to meet demand of any potential customer. 4 and 7 seats options. Tell us and we will implement it. with optional online stats module integration. Interested? Feel free to contact us. We will be happy to answer all of your questions.